Fairy tales and folklore get clever modern realist rewrites from National Book Award finalist Thompson (The Humanity Project, 2013; The Year We Left Home, 2011, etc.). Domineering parents, wicked siblings, wolves in sheep’s clothing—Thompson recognizes that one reason centuries-old children’s stories endure is because they’re readily applicable to any era. These eight tales apply the tropes of stories like “Sleeping Beauty” to hardscrabble Midwestern settings, and Thompson doesn’t feel beholden to the familiar plots; she uses them “only as a kind of scaffolding for new stories,” as she writes in the introduction. So the “prince” of “Inamorata” is a little slow thanks to a childhood head injury, while his “Cinderella” left her clear Lucite heels behind after a boozy party. 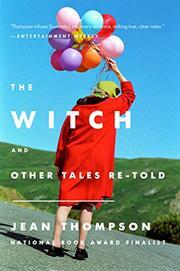 The tendency of fairy tales to feature trapped and imperiled young women is of particular interest to Thompson. The teenage girl in “Candy,” juggling an interest in boys while caring for her ailing grandmother, is just coming to recognize how her sexuality both empowers her and makes her vulnerable, and the ending brilliantly complicates the notion of who’s Little Red Riding Hood and who’s the predatory wolf. “The Curse” and “Your Secret’s Safe With Me” are effective “Rapunzel”-esque tales in which (respectively) an overprotective father and arrogant intellectual foolishly labor to shield women from the outside world. And in the closing “Prince,” the strongest story of the batch, a mentally troubled woman bullied by her sister is redeemed in part by the stray dog of the title. Not every story works: “Faith” is a thin riff on “The Pied Piper,” while “Three,” in which three brothers can’t save their divorced father from the blowsy, shallow would-be stepmom he’s dating, sputters to a close. Still, the best stories are entertainingly inventive, doing more than just transposing contemporary characters onto familiar tales.